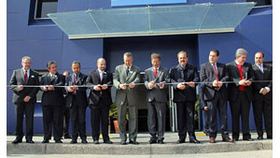 Preferred Compounding de Mexico had a ribbon cutting ceremony with CEO and President Ken Bloom and San Luis Potosi Governor Fernando Toranzo Fernandez (red tie) at center. SAN LUIS POTOSI, Mexico—Preferred Compounding de Mexico is investing heavily in its plant in Mexico in an effort to remain ahead of expected growth. A wholly owned subsidiary of Barberton, Ohio-headquartered Preferred Compounding Corp., the custom rubber compounder is nearing completion of an expansion at its San Luis Potosi facility. It also recently added new machinery and intends to bring on more personnel at the site. Preferred is constructing a 15,000-sq.-ft. addition to the plant, which currently spans about 66,000 square feet, according to Scott Lieberman, general manager of Preferred Compounding de Mexico and vice president of strategic initiatives for Preferred Compounding. Its newest addition primarily involves warehouse and office space, he said. The expansion is expected to be completed at the end of September. Lieberman said the company has completed the installation of a second Farrel F-270 black mixer along with an in-line gear pump strainer at the San Luis Potosi facility and is hiring salaried and hourly employees. Preferred's newest mixer doubles the firm's capacity to between 250 million and 300 million pounds, depending on whether the company is on a 24 hour, five- or seven-day schedule. It generally operates five days a week to give it some built-in free time and leave room to handle surge capacity, said Kenneth Bloom, president and CEO of Preferred Compounding, in an interview earlier this year. Preferred has compounding facilities in Barberton; Tallapoosa, Ga.; and Huntington, Tenn.
About 80 are currently employed at the factory, Lieberman said, and employment is expected to grow to nearly 100 by the beginning of winter. “We expected robust growth for this operation and are continuing to invest to stay ahead of it,” he said. Preferred's facility in Mexico provides custom rubber compounds primarily to U.S., European and Asian parts manufacturers in the country. The plant's services include flexible supply and materials agreements, compound development, improvement and testing resources, and the firm's MixLoc Quality Program, which includes 24 hour, seven-day online access to quality data and more, the company said. Preferred purchased the San Luis Potosi plant in 2012 from Iacp Jevsa, a Barcelona-based company.